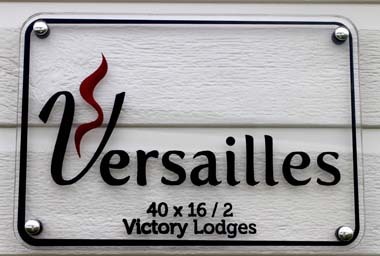 The two bedroom Victory Versailles holiday lodge measuring 40ft x 16ft is a tardis. 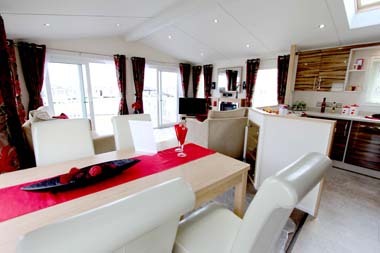 Built for 2014 it has all the hallmarks of the Hull base company’s philosophy; well thought out and distinctive interior décor, so it didn’t disappoint us. Two curved front sofas, an electric fire set on a plinth in a surround with a mirror above it and two speakers for the optional audio system wowed us as soon as we walked in via one of the two sets of double doors on the front aspect. 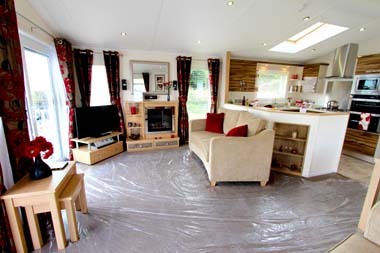 It’s a light and spacious living area, not just thanks to the double glazed doors, but to the full height windows around the room; patterned claret and bronze curtains hung on brushed chrome poles grace all of the windows and what a sight they would be at night with light reflecting off the sheen of the curtains – wow! The dining area has a table with four “leather look” comfortable chairs; perhaps the table could be a bit wider for when there are four sitting round it enjoying a leisurely, gourmet meal from the nearby kitchen. 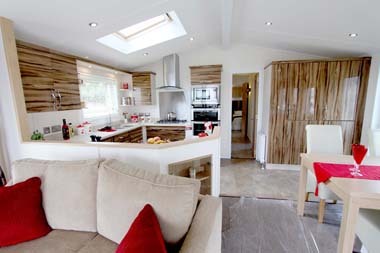 A shaped room divider has a low level display cabinet with double glass doors and moves into the kitchen which uses the width of the lodge to best advantage, with a fridge/freezer and tall pullout larder unit behind the dining table along with the cupboard for the condensing boiler for heating and hot water; there’s a well designed square kitchen on the other side with a five burner hob, a tall stainless steel stack of combination microwave, oven and grill and attendant cupboards. 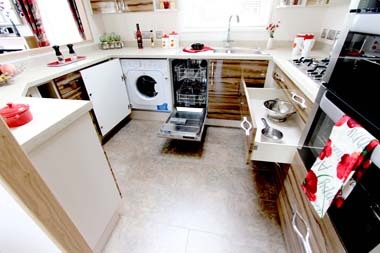 There are yards of work top space and set in this is a 1½ bowl sink and drainer. 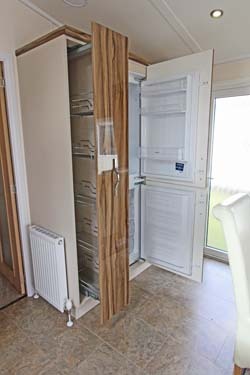 Ah yes, the colour of the units is a high gloss three-tone design horizontal stripe based around a brown colour scheme with and it’s very striking. 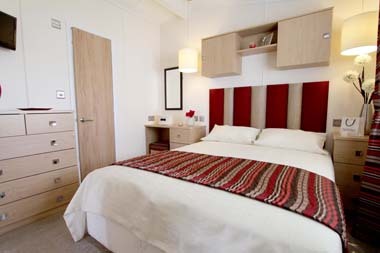 The master bedroom sports a magnificent red and gold padded headboard over the king size lift-up bed and curtains with horizontal stripes that reflect the colours in the living room. 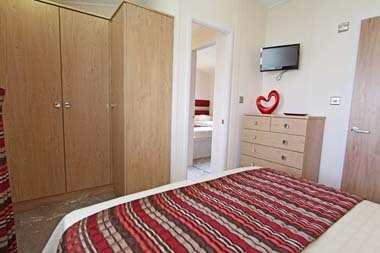 The hanging and clothes storage space is excellent and for the presentation conscious there is a decent mirror for checking those last minute sartorial adjustments. 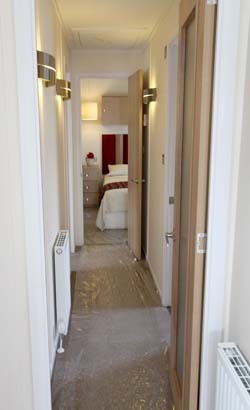 The en-suite bathroom has partially panelled walls, a chrome towel rail and a shaver or toothbrush socket. 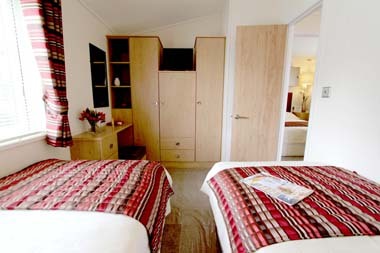 The second bedroom has twin beds, each 3ft wide, with free standing bedside cabinets, a dressing table and upholstered stool. 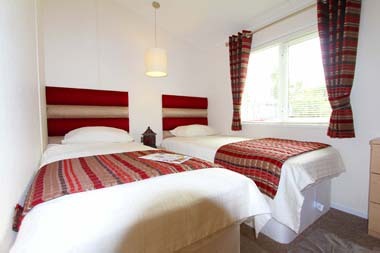 Padded headboards were expected and not disappointing. Again there is excellent storage for clothes. 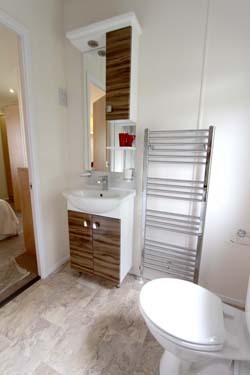 The shower room has a large rectangular shower, a semi-recessed basin and a chrome towel rail; all similar to the en-suite. 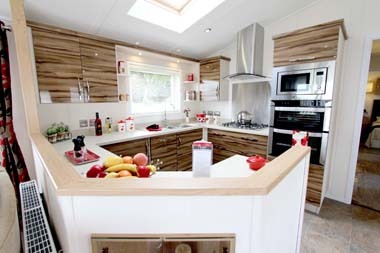 Various options are available to personalise your lodge; these include a Velux window in the kitchen, an integral washing machine, an entertainment pack and Canexel in various colours; all of these were in the display model we saw and are included in the price quoted. 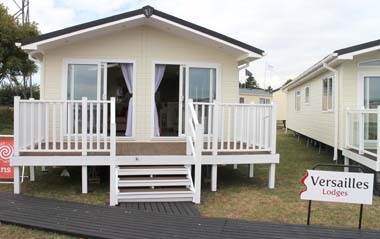 This is a twin unit built to BS 3632 standard, designed for residential purposes, but please refer to your chosen park’s licence and associated planning conditions before you commit to purchase this lodge. Verdict; if there were design awards for bold, decisive, clever use of interior colour palates, then the lady who does the interior design for Victory should be nominated. 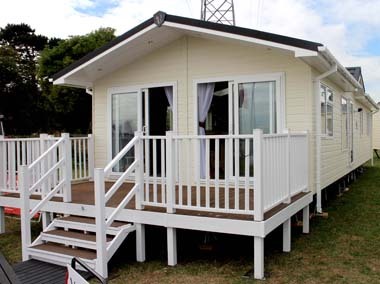 It’s a very well specified holiday lodge, with clever use of interior space, it’s difficult to think of it as only sixteen feet wide and it’s good value for money. *Ex-works price includes VAT at 20%. Additional charges will be made by park operators, and/or distributors for transportation, siting and annual maintenance. Please check the price carefully before you commit to purchase, as prices vary considerably dependent, amongst other factors, on the geographical location of your chosen park.